In the referendum of 23 June 2016, the UK voted to leave the European Union. However, in constitutional terms, nothing has changed. The Leave side won but Brexit has not been triggered. The UK remains a member of the EU. No formal negotiations have been held; no exit terms have been decided. Despite demands by leading EU figures, the EU cannot force the UK to send the formal Article 50 notification that would begin the process of leaving. It is even conceivable that no notification will ever be sent. The UK's prime minister has declared that 'Brexit means Brexit' - but the UK government is struggling to grapple with the problems of Brexit, and there is no obvious way out. How did this situation come about? What options does the UK now have? What does a Brexit mean for the UK and the EU, and for the UK's crucial relationships with overseas partners such as the US? This book offers an accessible and unbiased guide to Brexit: the issues and events that led to the vote, the political turmoil that has resulted from it, and the crisis the UK now faces. It examines key debates over 'sovereignty', immigration, and UK contributions to the EU, which led to the Leave vote. It explains the controversy surrounding Article 50 of the EU treaty: what is the process necessary for leaving the EU, and how might the UK approach the monumental task of disentangling its legal system from the EU? It scrutinises the exit strategies being weighed up the UK government, and the fraught negotiations over free movement of people and access to the single market. What might the exit agreement look like? What are the implications of 'hard' Brexit or 'soft' Brexit-or no Brexit at all? 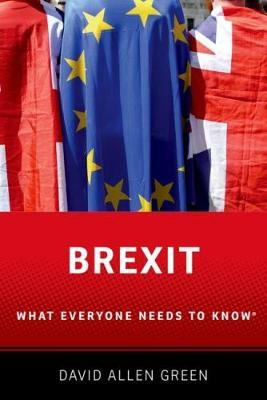 The book is a key reference for anyone seeking to understand the important and complex issues of Brexit, and its wide-ranging consequences. David Allen Green is a journalist and lawyer. David is law and policy commentator for the Financial Times and has a personal blog at Jack of Kent. In 2014 David was mainstream media blogger of the year. David has also been shortlisted for the Orwell Prize and as digital journalist of the year by the London Press Club. David is also a consultant solicitor practising in commercial law, media and communications law, public law and EU law for Preiskel & Co LLP in the Temple, London.